I'm making good progress on my Cozy Cabin jacket. The front and back sections are done and tonight I joined them all together and started the shoulders and collar. Very carefully joined them, I might add. After the last mistake, I wanted to make sure I didn't do something studip like join these backwards or twisted or something. 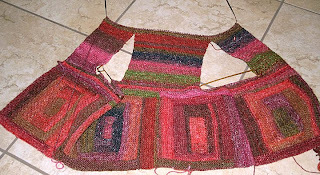 I'm hoping Anne will show me how to start the sleeves Thursday night so I can keep working. 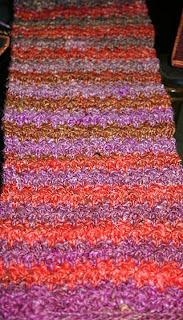 Also made some progress on the second Noro striped scarf. I'm loving the reds and purples together. Much better than the combo I tried before this. Can't wait to get this done and see all the colors together.